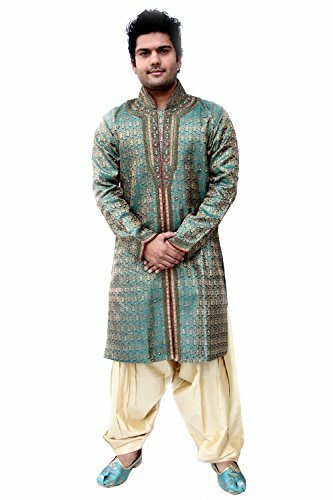 A dazzling semi sherwani with wonderful ethnic touch given to a premium silk brocade fabric, made to turn heads in your Sangeet ceremony. Jive to the music with this ravishing coloured fabric and handwork of cut-dana and jarkan diamonds embellishing the work all over. The manifold is made with wonderfully matching colours and design with cora border and work in the neckline and those spectacular sleeves. The contemporary flavor given to the traditional semi sherwani is just amazing!